Lenovo’s Motorola on Thursday said goodbye to the Moto X branding at Tech World 2016. 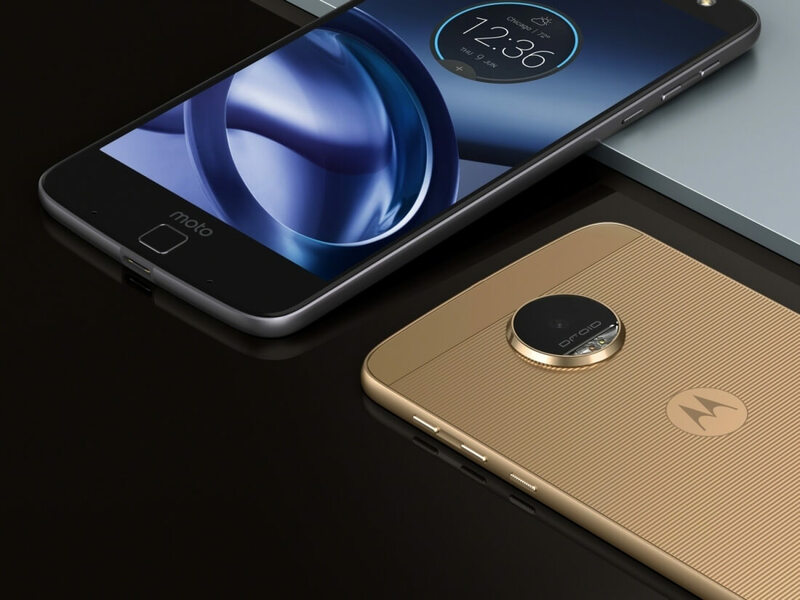 In its place is a new line – the Moto Z – that’s debuting with two flagships, the Moto Z and the Moto Z Force. The new Moto Z is being billed as the thinnest flagship in the world, measuring just 5.19 millimeters thick and tipping the scales at 136 grams (4.8 ounces). The key word here is “flagship” as there are thinner smartphones in the wild but I digress. The handset packs a 5.5-inch Quad HD (2,560 x 1,440, 535 PPI) AMOLED display driven by Qualcomm’s quad-core Snapdragon 820 SoC, Adreno 530 graphics, 4GB of RAM and 64GB of local storage (expandable via microSD). There’s a 13-megapixel rear-facing camera with autofocus, optical image stabilization and an f/1.8 aperture lens that adds a sizable hump to the phone, a 5-megapixel selfie cam up front, a fingerprint reader and a USB Type-C connector on the bottom. That USB Type-C connection is all you get as there is no 3.5mm headphone jack on the device. Although there will be an adapter, this design decision will certainly drive some prospective buyers away despite the odds that 3.5mm jacks will likely be going away in droves over the coming months and years. The Moto Z includes a 2,600mAh battery that’s rated for up to 30 hours of use and will ship running Android 6.0 Marshmallow. The Moto Z Force, meanwhile, is a bit thicker and heavier at 6.99mm and 163 grams (5.75 ounces), respectively. It, too, has a 5.5-inch Quad HD AMOLED display but this time, it’s coated with a ShatterShield screen. The Moto Z Force also swaps out the 16-megapixel rear camera for a 21-megapixel model and a larger 3,500mAh battery that’s reportedly good for 40 hours of use. Otherwise, the two devices are virtually identical. You may have noticed on the back that there’s a 16-pin interface. Along with a magnetic system, this enables Motorola’s modular components to connect to the device. Dubbed MotoMods, there are aesthetic-only rear cover add-ons called Style Shields as well as functional accessories including a 50-lumen pico projector that outputs up to a 70-inch image, an external 2,200mAh battery pack and a 6W JBL speaker system that pumps out up to 80 decibels. Final judgment will be reserved for when we get these in to test although at first glance, Motorola’s approach to modular accessories seems far more practical than what we recently saw from LG. Motorola hasn’t yet revealed how much its new phones and accessories will sell for. Following an exclusive stint with Verizon, we should see unlocked versions land sometime in September.